Windows Server 2008 R2 includes an additional tool for system resource management, WSRM, a feature that can be added through Add Features in Server Manager. WSRM can be used in two ways. First, it can be used to profile applications. This means that it helps identify how many resources an application requires on a regular basis. When operating in this mode, WSRM logs events in the application event log only when the application exceeds its allowed limits. This helps you fine-tune application requirements. The second mode offered by WSRM is the manage mode. In this mode, WSRM uses its allocation policies to control how many resources applications can use on a server. If applications exceed their resource allocations, WSRM can even stop the application from executing and make sure other applications on the same server can continue to operate. However, WSRM does not affect any application if combined processor resources do not exceed 70 percent utilization. This means that when processor utilization is low, WSRM does not affect any application. WSRM also supports Alerts And Event Monitoring. This is a powerful tool that helps you control processor and memory usage on large multiprocessing servers. By default, the WSRM includes four built-in management policies, but it also includes several custom resources that you can use to define your own policies. Basically, WSRM ensures that high-priority applications always have enough resources available to them for continued operation, making it a good tool for DCs. If you use single-purpose DCs, you will not need WSRM as much as if you use multipurpose DCs. Multipurpose DCs usually run other workloads at the same time that they run the AD DS service. Using WSRM in this case can ensure that the AD DS service is available during peak hours by assigning it more resources than other applications. However, consider your choices carefully when deciding to create a multipurpose DC. DCs are secure servers by default and should remain this way at all times. If you add workloads to a DC, you must grant access rights to the DC to application administrators, administrators who do not need domain administration access rights. Use WSRM to first evaluate how your applications are being used; then apply management policies. Make sure you thoroughly test your policies before applying them in your production environment. This way, you can get a feel for WSRM before you fully implement it in your network. When you’re ready, you can use WSRM Calendar to determine when each policy should be applied. If you are managing several servers with WSRM, you might need to dedicate resources to it because it is resource-intensive. You might consider placing it on a dedicated management server if this is the case. Use predefined or user-defined policies to manage system resources. Resources can be allocated on a per-process, per-user, or per-IIS application pool basis. Rely on calendar rules to apply your policies at different times and dates without any manual intervention. Automate the resource policy selection process based on server properties, events, or even changes to available physical memory or processor count. Collect resource usage information in local text files or store them in a SQL database. You can also create a central WSRM collection system to collate resource usage from several systems running their own instances of WSRM. Table 3 describes the default policies included in WSRM as well as the custom resources you can use to create custom policies. Assigns each application an equal amount of resources. Groups processes assigned to each user who is running them and assigns equal resources to each group. Allocates resources equally to each session connected to the system. Allocates resources equally to each running IIS application pool. Used to match services or applications to a policy. Can be selected by file name, command, specified users, or groups. Used to allocate processor and memory resources to the processes that match criteria you specify. Used to exclude applications, services, users, or groups from management by WSRM. Can also use command-line paths to exclude applications from management. Uses a calendar interface to set time-based events to resource allocation. Supports policy-based workloads because you can set policies to be active at specific times of day, specific days, or other schedules. Used to set conditions based on specific events to determine whether policy will run. WSRM can completely control how applications can and should run. In this practice, you use both WRPM and WSRM to view the performance of your servers. First you create a custom collector set, and then you run it and view the diagnostics report. In the second exercise, you install WSRM to view the policies it provides. These exercises rely on SERVER10, but SERVER11 should also be running. A data collector set is the core building block of performance monitoring and reporting in WRPM. You can create a combination of data collectors and save them as a single data collector set. Log on to SERVER10 with the domain Administrator account. You need to be a member only of the Performance Log Users group with the Log On As A Batch Job user right, but for the purpose of these exercises, you use the domain administrator account. In Server Manager, expand Diagnostics\Performance\Data Collector Sets, right-click User Defined, point to New, and then click Data Collector Set. On the Template page, type Custom AD DS Collector Set, make sure Create From A Template (Recommended) is selected, and click Next. 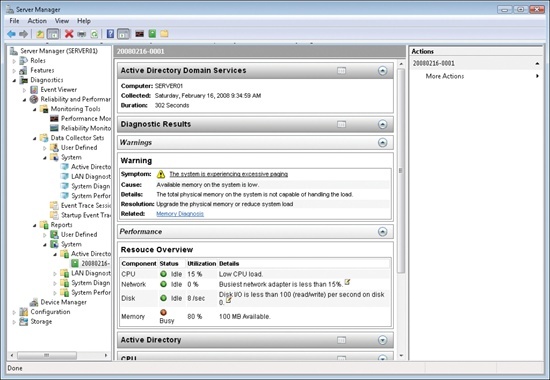 On the next page, select the Active Directory Diagnostics template and click Next. By default, the wizard selects %systemdrive%\PerfLogs\Admin as the root directory; however, you might prefer to keep your collector sets on a separate drive if one exists. In this case, click Browse, choose drive D, and create a new folder named AD DS Collector Sets. Press Enter and click OK to close the dialog box, and then click Next. On the Create The Data Collector Set page, click Change next to the Run As field, and type the account name TreyResearch\Administrator and the password to run the data collector set. When you create collector sets for long-term use, use a special account that is a member of the Performance Log Users group and has the Log On As A Batch Job user right to run your collector sets. Note that the Performance Log Users group has this right assigned to it by default. Open Properties Data For This Data Collector Set to view the properties of the data collector set or to make additional modifications. Start This Data Collector Set Now to run the data collector set immediately. Save And Close to save the data collector set without starting the collection. Leave the defaults and click Finish. Right-click Custom AD DS Collector Set and click Properties. On the Schedule tab, click Add to create a start date, time, or day schedule. In the Folder Action dialog box, make sure that today’s date is the beginning date, select the Expiration Date check box, and set it as one week from today. Also, make sure that the Start Time is set to the current time. Click OK.
You must set the start date of the schedule to the current time for the collection set to work. If not, you will not be able to generate reports in later steps. Note that you can create quite a modular schedule in this dialog box. Also note that selecting an expiration date will not stop data collection in progress on that date. It only prevents new instances of data collection from starting after the expiration date. You must use the Stop Condition tab to configure how data collection is stopped. On the Stop Condition tab, select the Overall Duration check box, make sure it lists 5 minutes, and select the Stop When All Data Collectors Have Finished check box. Click OK and type the password for the account you assigned to this collector set, and then click OK again. You select the Stop When All Data Collectors Have Finished check box to enable all data collectors to finish recording the most recent values before the data collector set is stopped if you have also configured an overall duration. To segment data collections into separate logs, select the Restart The Data Collector Set At Limits check box. To configure a time period for data collection to write to a single log file, select the Duration check box and set its value. To restart the data collector set or to stop collecting data when the log file reaches a specific limit, select the Maximum Size check box and set its value. 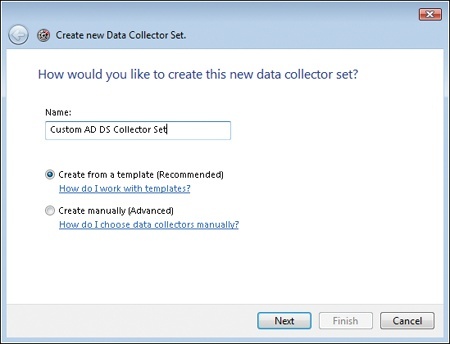 Right-click Custom AD DS Data Collector Set and click Data Manager. On the Data Manager tab, you can accept the default values or change them according to your data retention policy. Keep the defaults. Select the Minimum Free disk or Maximum Folders check boxes to delete previous data according to the resource policy you choose from the drop-down list (Delete Largest or Delete Oldest). 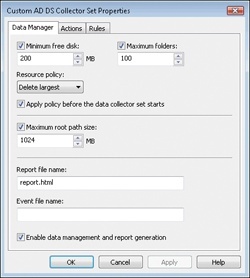 Select the Apply Policy Before The Data Collector Set Starts check box to delete previous data sets according to your selections before the data collector set creates its next log file. Select the Maximum Root Path Size check box to delete previous data according to your selections when the root log folder size limit is reached. On the Actions tab, you can set specific data management actions for this collector set. Note that three policies already exist. Click the 1 Day(s) policy and click Edit. Folder actions allow you to specify how data is archived before it is permanently deleted. You can decide to disable the Data Manager limits in favor of managing all data according to these folder action rules. For example, you could copy all collection sets to a central file share before deleting them on the local server. Click OK, and then click OK again. Type the password for the account you assigned to the collector set and click OK.
Right-click your new collector set and click Start. This generates a new report. Expand Diagnostics/Performance/Reports/User Defined/Custom AD DS Collector Set in the tree pane of Server Manager; you see that the collection set has generated a report. Click the report name in the tree pane to view it. You can also use the other default templates to generate immediate reports. For example, if you want to run a report from the Systems Diagnostics template, right-click the template name under the System node and select Latest Report. If no report exists, it runs the collector set and then displays the report in the details pane. In this exercise, you install the WSRM service and view how it operates. This exercise is performed on SERVER10; ensure that it is running. In Server Manager, right-click the Features node and click Add Features. On the Select Features page of the Add Features Wizard, select Windows System Resource Manager. Server Manager prompts you to add Windows Internal Database. Click Add Required Feature, and then click Next. Note that Windows Internal Database is a locally used database only and does not accept remote connections. To collect data from other servers, you must use Microsoft SQL Server 2005 or later. Review the information on the Confirm Installation Selections page and click Install. Examine the installation results and click Close. You can now use WSRM on this system. 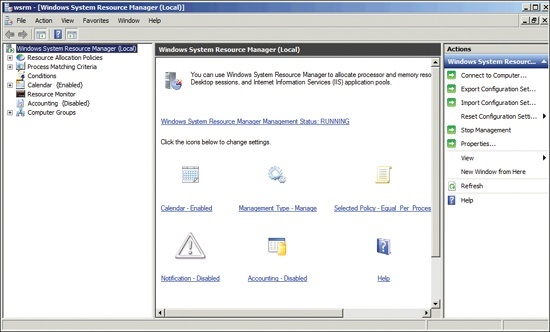 Windows System Resource Manager is a stand-alone console that can be found in the Administrative Tools program group. When you open the console, it asks you which computer to connect to. Select This Computer and click Connect. Now you can tour the WSRM interface. (See Figure 7.) Note that it uses the standard Microsoft Management Console format. Explore the features of this console.